1 week at least in advance make nasturtium capers by sprinkling salt over the nasturtium seed pods and leave in the fridge for overnight. The next day bring vinegar and sugar to the simmer so sugar dissolves, let cool. Rinse salt off of nasturtium seed pods and add to pickle liquid. Keep refrigerated for up to 1 year. 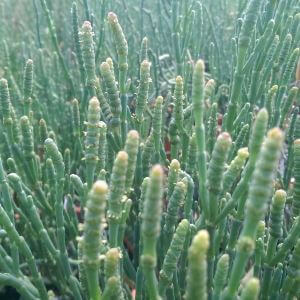 Bring a pot of water to the boil and drop in samphire for 30 seconds, then refresh in iced water, drain. Slice beef really thin and arrange onto 4 plates, season. Spoon on some mayonnaise and drizzle with olive oil. 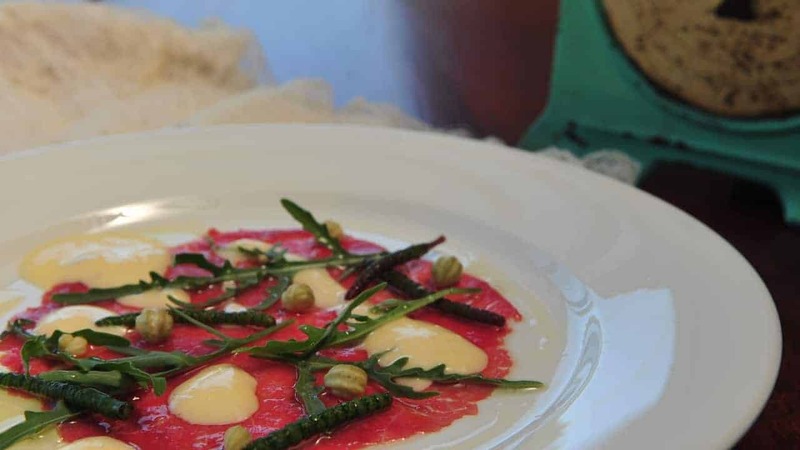 Scatter with samphire, nasturtium capers and garden leaves.